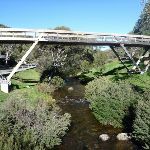 This walk explores the Thredbo River from the village then loops around the golf course before returning along the roads to the Valley Terminal. 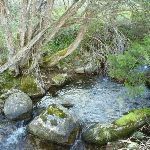 You will see some snow gum forests and enjoy the Thredbo River from many angles. Allow some extra time to sit on a rock beside the river and enjoy the trout swimming past. 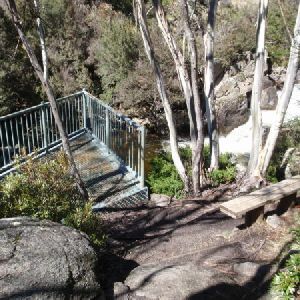 From the big map outside the ticket store at the bottom of the Kosciuszko Express Chairlift, this walk follows the ‘Riverside Walk’ sign down to cross the bridge over Thredbo River. Here the walk turns right onto Friday drive and follows the footpath under the footbridge heading between the road and the river. 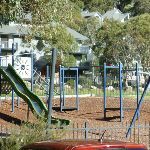 The walk follows the road past the children’s playground (on your left) and beside the car park, past the pond to come to a four-way intersection with ‘Diggings Terrace’, just past a small pond. 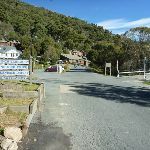 Turn right: From the intersection, this walk follows the ‘Crackenback Drive’ sign across the bridge, over Thredbo River. The walk then comes to a signposted intersection in front of the ‘Thredbo Memorial Community Centre’. This nine hole AGU (Australian Golf Union) rated course is the highest in Australia. 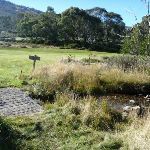 Nestled in beside Thredbo village, and bordering the Thredbo River, this course offers a great form of relaxation, and gives golfers a wonderful way to enjoy the Snowies, without having to travel too far from the village. More info. 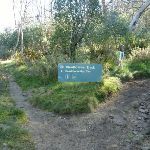 Turn left: From the Community Centre, this walk follows the ‘Riverside Walk’ and ‘Dead Horse Gap’ signs down the track towards the river. 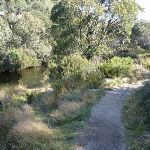 The track leads alongside the river for approximately 100m before bending up and leaving the bush to come to the edge of the Golf Course, behind the community centre. Continue straight: From the intersection, this walk follows the well worn track winding around the edge of the golf course, away from the community centre. After about 30m this walk crosses a short metal bridge, to then come to an intersection at a larger timber bridge (on your left). 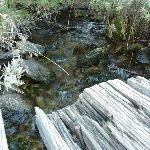 Continue straight: From the wooden bridge, this walk follows the track whilst keeping the river to your left. The track gently meanders between the golf course and the river, enjoying some sections very close to the river. 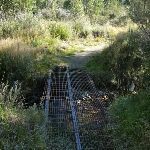 The track heads over a few metal grates and over a small metal bridge to come to an intersection next to the golf course marked with a small timber bridge (over a small creek), just before the pump house. 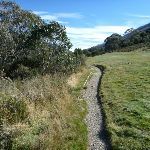 Continue straight: From the intersection, this walk follows the clear track towards the green timber hut, keeping the Thredbo river to your left. 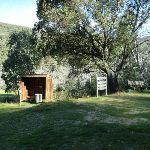 The track soon passes the pump house (the green timber hut) and leads beside the river for about 150m before turning right and heading uphill. 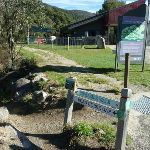 The walk then heads up the steps to find a clear three-way intersection marked with a large ‘Thredbo River Track’ sign. Veer right: From the intersection, this walk follows the green and black arrows uphill. 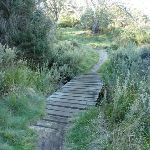 The track leads over a small rise then downhill and across a small creek via a flat timber bridge. The track then leads up the hill for about 80m, coming to the golf course next to the signposted ‘The Wedge’ – the 6th hole tee. Continue straight: From next to ‘The Wedge’, this walk follows the green and black arrows uphill along the track, keeping the golf course to your right. The track then bends left and heads into the bush, climbing the hill. 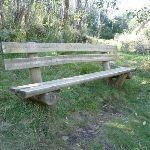 After about 150m, the track crosses a metal grate, then climbs a series of steps for about another 100m to find a bench seat with valley views. Here, the walk continues along the track through a grove of snow gums, past another bench seat and down to a signposted ‘T’ intersection with a gravel management trail. Turn right: From the intersection, this walk follows the ‘Riverside Walk’ sign downhill along the wide gravel management trail. After about 40m, this walk turns left at the ‘T’ intersection and continues down the management trail, soon coming to a gate at the end of Cascades Close. Continue straight: From the end of Cascades Close, this walk heads downhill along the road. 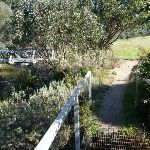 At the ‘T’ intersection, this walk turns right and follows the ‘Riverside Walk’ arrows down along Crackenback Drive. 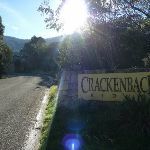 The road winds down, out the ‘Crackenback Ridge’ boundary then down to the intersection in front of the Thredbo Memorial Community Centre (just before the bridge). 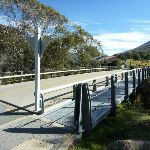 Continue straight: From the Community Centre, this walk follows the road across the bridge, over Thredbo River to come to a signposted intersection with ‘Friday Drive’. Turn left: From the intersection, this walk heads downhill following the ‘Friday Drive’ sign past the pond (on your right). The road leads through a car park and past the children’s play ground. In time the walk follow the footpath beside the road that leads under a footbridge, where this walk then turns left across the road bridge. Here the walk tends left up the road to find a large map and the entrance to the tickets station at the bottom of Kosciuszko Express chairlift. 1.6km of this walk is flat with no steps and another 1.2km has gentle hills with occasional steps. The remaining (480m) has short steep hills. 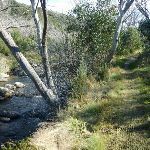 1.8km of this walk follows a clear and well formed track or trail and another 1.3km follows a smooth and hardened path. The remaining (120m) follows a formed track, with some branches and other obstacles. Around 2km of this walk is clearly signposted, whilst the remaining 1.3km has directional signs at most intersection. This whole walk, 3.3km requires no previous bushwalking experience. Around 1.9km of this walk is affected by storms that may impact your navigation and safety, whilst the remaining 1.3km is not usually affected by severe weather events (that would unexpectedly impact safety and navigation). This whole walk, 3.3km is close to useful facilities (such as fenced cliffs and seats). A list of walks that share part of the track with the Riverside and Golf Course Walk walk. 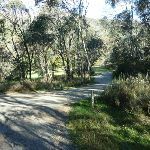 This walk starts at Thredbo and follows the Riverside Track, along the Thredbo River. 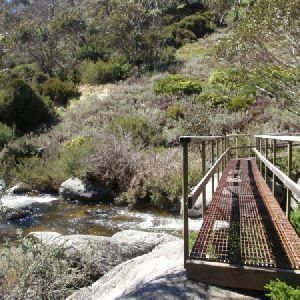 The walk passes the golf course and heads through the snow gum forest to the Thredbo River cascades lookout. 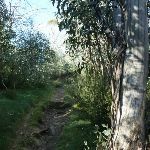 This walk uses a well defined track from the outskirts of Thredbo Village. 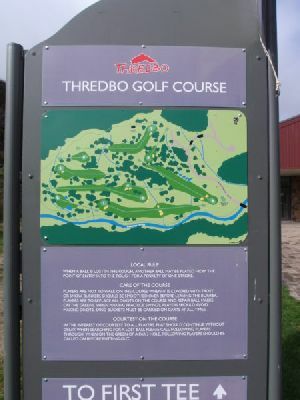 Starting from Thredbo Village you wander along a few roads to the Thredbo Golf Course then follow the track as it winds along beside the Thredbo River to the Alpine way just near Dead Horse Gap. 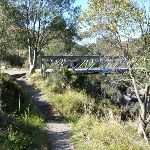 You will stroll through some lovely snow gum forests and enjoys views down to the river from the cascades lookout and various bridges. 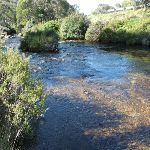 An enjoyable way to explore the Thredbo River and the valley environments. 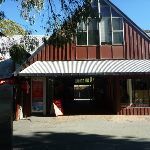 A list of walks that start near the Riverside and Golf Course Walk walk. 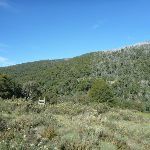 This walk explores the native bushland around the winter skiing area. After riding the Kosciuszko Express chairlift up the hill, arriving near the Eagles Nest restaurant, the walk winds through the snow gum forest, following ski runs and bush tracks back down the hill. 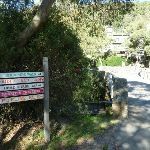 The walk passes the popular Thredbo Bobsled and continues around the back of the tennis courts, back to the village. This walk starts with a scenic journey to the top of the hill on the chairlift. 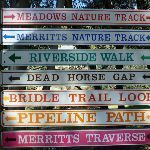 Starting along Merritts Nature walk, this walk soon detours down the hill by following a series of signposted management trails and ski runs. 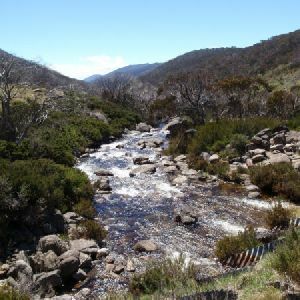 The walk visits a few scenic creeks, but the main highlights are the wide views of Thredbo Valley. 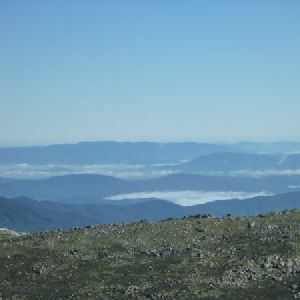 This scenic walk explores the start of the track heading towards Mt Kosciuszko from the top of the Kosciuszko Express chairlift. 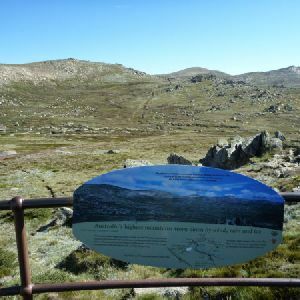 The walk takes you to the Kosciuszko Lookout, following along side the Rams Head Range, along the metal walkway. 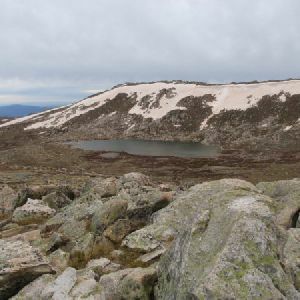 This walk takes in the views of Thredbo, North Rams Head and Mt Kosciuszko. 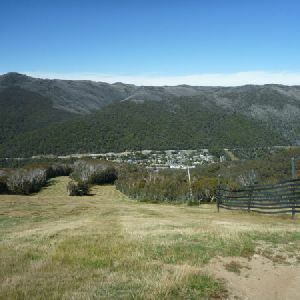 From the lookout you can even see the headwaters of the Snowy River, a few hundred meters to the north. 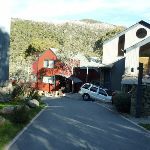 This walk starts at the Thredbo Village and takes a ride up the Kosciuszko Express chairlift to the Eagles Nest restaurant. 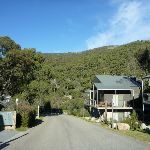 Then on foot, you head along the footpath, winding up towards Mt Kosciuszko, passing North Rams Head and the Kosciuszko lookout. The walk soon arrives at the metal platform overlooking Lake Cootapatamba. 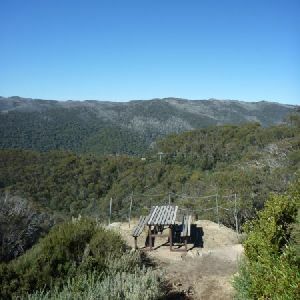 There are great views through this alpine area along this popular walking track. 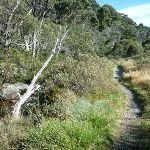 This circuit walk offers an enjoyable way of exploring the diverse environments near Thredbo Village. 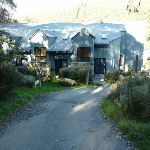 Starting near the centre of town, you will follow the Merritts Nature Track partway up the hill. Then, following the Meadows Nature Track signs, you cross a series of open ski runs before heading back into the bush. Through this section of forest, you visit a delightful mossy creek with a small weir, then head down another ski run to return the valley terminal. 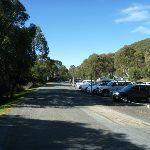 Starting from the Village Terminal, this walk leads you past the bobsled then down to Friday Drive and across the Thredbo River. From here, you follow the signposted Pipeline Path, a dirt track, along the hillside. 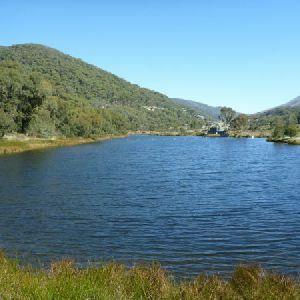 The track leads to the picture-perfect Snowmakers Ponds for a picnic or a dip. Either retrace your steps or follow the rest of the notes back to the start following Friday Drive. An enjoyable stroll out from the village. 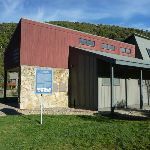 This short, relaxing walk starts from Thredbo and follows the Merrits Nature Track to the village weir. 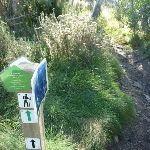 A great walk for those who enjoy following a well signposted track. The weir is a lovely spot to stop for lunch before the return journey, back down the hill to Thredbo. 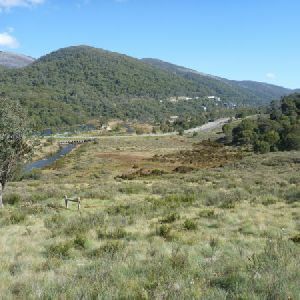 This walk starts by heading through Friday Flats and following a signposted track along the grassy open hillside of Thredbo River valley. 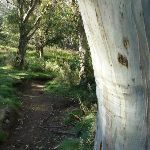 You follow the loop through an enchanting snow gum forest, enjoying more valley views in places. 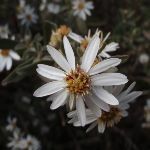 A peaceful walk, with only a few short hill climbs, and particularly nice when the wildflower are in bloom. 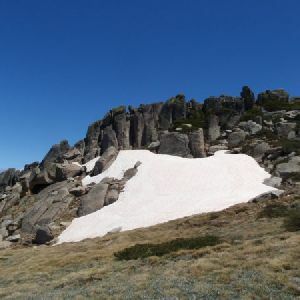 This enjoyable walk starts at Dead Horse Gap, the highest point on the Alpine Way. 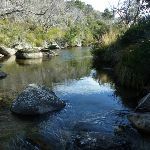 The walk follows the Riverside track downstream, along the Thredbo River, through the valley and the snow gum forest to the cascades lookout. 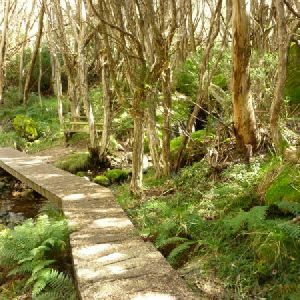 This walk follows a well defined track and, although close to the road, you can feel a million miles from anywhere. 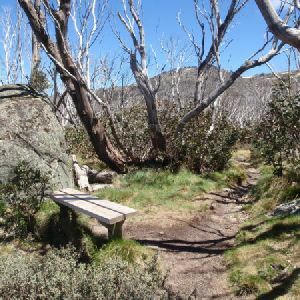 Starting from near Dead Horse Gap on the Alpine Way, this walk follows the signposted track across Bogong Creek and up the ridge to top of Kosciuszko Express chairlift. 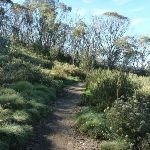 This walk provides wide views that expand as you climb, exploring a snow gum forest lower down and the open grass herb fields as you pass above the tree line. The chairlift offers an easy ride down the hill, or there are a variety of options to walk down to the village. 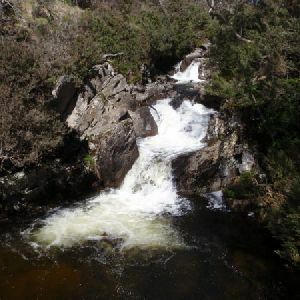 Starting near Dead Horse Gap on the Alpine Way, you will follow the wide Cascade Trail upstream along the Thredbo River. 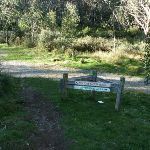 After crossing the river, you will follow the trail through snow gum forests to the signposted Bobs Ridge. From the rocky outcrops at Bobs Ridge, there are great views west over the Murray River valley into Victoria. 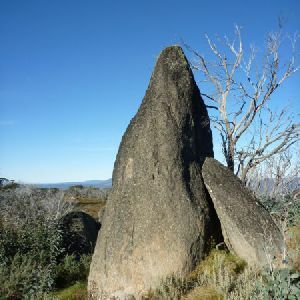 This is an enjoyable walk exploring a great river, granite boulders and snow gum forests. 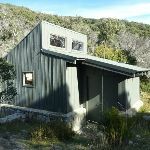 http://new.wildwalks.com/wildwalks_custom/includes/walk_fire_danger.php?walkid=nsw-kosciunp-ragcw Each park may have its own fire ban, this rating is only valid for today and is based on information from the RFS Please check the RFS Website for more information.